Fully Loaded Deep Dish Breakfast Frittata with Comté Cheese, Bacon, Sausages, Tomatoes and Mushrooms – perfect for brekfast, brunch or lunch. Post sponsored by Comté Cheese. When it comes to breakfast we like to have full-on feasts on weekends and special occasions – the ‘full experience’ as my 5 year old calls it. And with Father’s Day around the corner I thought it was high time I shared my fully loaded deep dish breakfast frittata. As the name suggests, this is not for the faint of heart as it is packed with sausages, bacon, tomatoes, mushrooms and delicious mature Comté cheese. It is a breakfast in-a-pan extravaganza and a small slice goes a long way. In fact this will keep you going till lunch or you can serve it for lunch instead of breakfast. Comté cheese holds a really special place in my heart as it was my first big food photography job (photographing the products of The French Comté back in October). Comté is a long lasting hard aged cheese, made in the Jura Massif in Franche-Comté region in Eastern France, close to the Alps. The cheese has been made in the area for thousands of years and the artisan traditions are still followed today. The cheese is made with the raw milk of Montbéliarde cows without any additives. The milk, produced at 2,500 local farms, has to be turned into cheese within 24 hours of delivery and the resulting cheese has its own personality depending the production area and season, in addition to the natural making process and the ageing period. 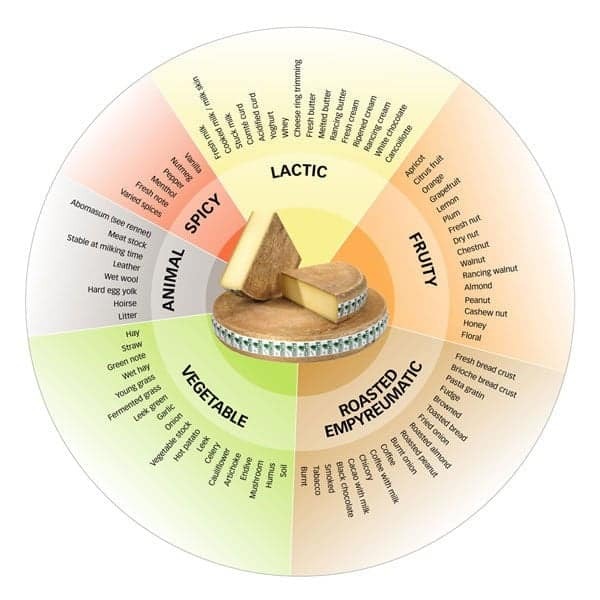 The ageing, in maturing cellars, can take anything from 4-36 months which allows Comté to develop its unique flavour – creamy, nutty and a little peppery on the tongue. The more mature the Comté, the more complex the taste – I prefer using the slightly harder, aged cheese in my cooking. The history and traditions behind Comté are quite fascinating – lots of Comté farms, fruitières and maturing cellars are open for visitors if you fancy exploring further. For me, it is the addictive taste and versatility that keeps me coming for more. This recipe was commissioned by Comté Cheese UK. Find them on Instagram, Twitter and Facebook. This fully loaded deep dish frittata is perfect for breakfast, brunch or lunch. You will need a 20cm/8in deep skillet or ovenproof pan. Preheat the oven grill to medium hot (about 180C/350F). Lightly beat the eggs, grated cheese and the chopped parsley together in a bowl. Season with a little salt and plant of black pepper. Pan fry the bacon in a non-stick frying pan until crisp, then drain on kitchen towels. Chop half into small cubes and add to the eggs. Add the sliced mushrooms in the same pan as the bacon and cook for 3-4 minutes. Set aside. Wipe the skillet with the oil and heat on the stove. Add a half of the egg mixture into the skillet and as soon as it starts to cook, layer some mushrooms, sliced cooked sausage and tomatoes over the top. Continue to cook until the middle starts to set, adding the rest of the beaten eggs on top. Layer the remaining bacon, mushrooms, tomatoes and sausages over the top, letting them sink into the eggs. Once the frittata is set at the edges with a wobble in the middle, sprinkle with a little finely grated Comté, transfer to the oven and cook for a further 20-30 minutes or until set. Leave the frittata in the skillet for 10 minutes (it will remain piping hot) and then remove with a spatula onto a warmed plate. Serve immediately or leave to cool completely before eating. You're a geeenius! I've made full English baked eggs before, but I love the idea of making one big frittata to slice up. Perfect make-ahead breakfast! I do love frittata and especially the next day sliced up for lunch or a picnic. I am now craving all the Comte too! Yum, your frittata looks delicious Lucy. What a great idea for a weekend breakfast treat & I bet it tastes just as delicious cold.